As I caught a glimpse of the last few empty pages in my journal I started reflecting on the art of journaling and why I started it in the first place. 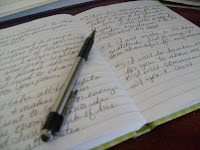 I don't know about you but as a new Christian (5 years ago that is) I had heard several times from well meaning ladies, the importance of journaling. Whether it was to document your prayers in written form or keep a list of things your grateful for... journal, journal, journal, you MUST journal! Oh how I tried, attempted for a few days, a few weeks, and failed,attempted again and failed...again. So I was a little ecstatic to see only two fresh, untouched pages left in my journal today! It made me ponder why. Why did I finally, after many failed attempts, keep at it? So I thumbed back to my very first entry which I am now going to be transparent and share with you. In this I think we'll find our answer. I love looking back and reading past journals. It's such a good reminder to me about how faithful God is and how I've grown and changed through the years. Exactly Lisa! It's a great faith builder isn't it? I can't seem to stick with journaling and I've tried for years and years. I wish I could be more disciplined. Kathy I know the feeling that's exactly how I was until I NEEDED it for survival so to speak! Now I cannot do without journaling every few days. I also love reading back through old entries to see how God has worked through a situation I may not have "seen" otherwise. Don't be yourself up though!